Railway Protection Force ( RPF ) of NF Railway has been doing commendable work for ensuring safety of train passenger. during this current year RPF of NF Railway was successful in apprehending 61 criminals on charges of theft of passenger belongings . Here are few incident which was mentioned in a press release of NF Railway . On 25.06.2018, at about 03.07 PM, on receipt of information about snatching of a mobile hand set from a passenger of 15636 DN in coach no S-8 berth no – 71 RPF immediately swung into action. 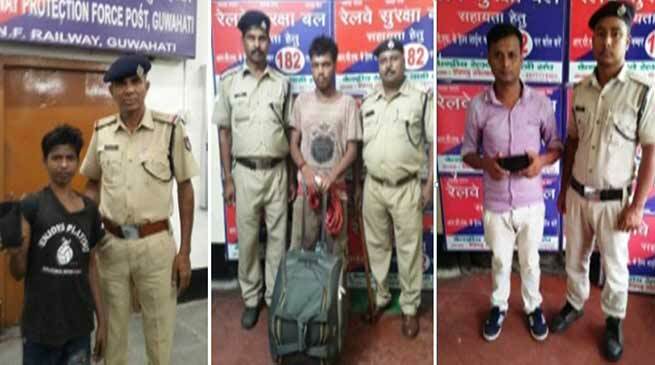 Head Constable / Dipak Chandra Das alongwith Constable /Kamal Hussain of the “Anti-Theft of Passenger Belongings (TOPB)” team of Guwahati arrested one boy namely Ajgar Ali aged 13 years s/o Azad Ali of Vill + PO Bilashipara, dist- Dhubri(Assam) with recovery of the mobile handset. The arrested person was handed over to OC/GRP/Guwahati with the mobile handset for appropriate action. On 26.06.2018 at about 10.25 AM, Asst. Sub Inspector/RPF Shri Ranjit Medhi alongwith staff of Kamakhya RPF post arrested one person namely Kamal Debnath aged about 30 years, s/o Jagadish Debnath with recovery of one bag containing valuable documents, garments, journey tickets, Identity card which was stolen from Shahbaz Alam a passenger of 12506 UP. The arrested person alongwith recovered bag was handed over to OC/GRP/Guwahati for appropriate action. Again on 05.07.2018 RPF staff of Kamakhya station apprehended one person namely Nilamoni Deka aged 33 years s/o of Khagengra Deka of Vill- Borakhat, PO-Purani Tangla, dist Udalguri(Assam) alongwith recovery of a mobile hand set snatched from one Pobitra Sarkar passenger of 25657 UP. The arrested person was later handed over to IC/GRP/Kamakhya for necessary action.